This item is currently available at my Etsy store. You don't have to be a PayPal user, you may use Credit Card for payment. I am pleased to inform you that my 4th Step-by-Step Wire Jewelry Tutorial has now been published and available at de Cor's Handmades Etsy store. 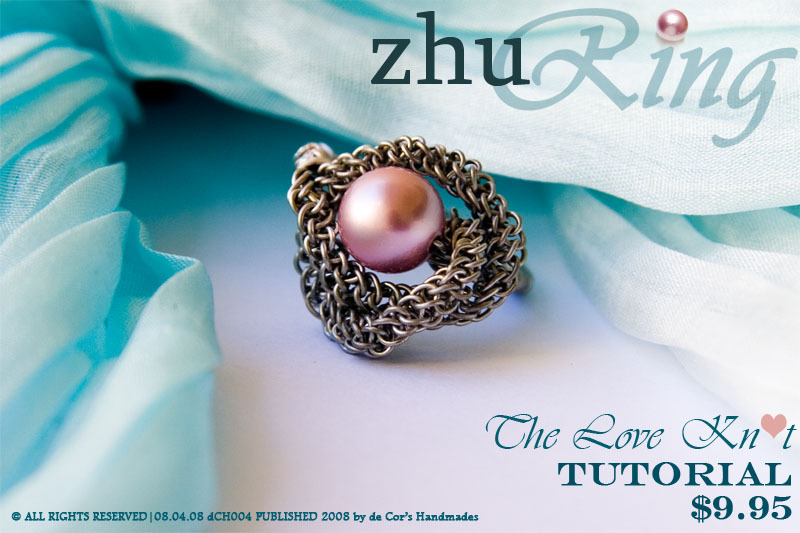 Introduction of DCH004 - ZHU.RING, Wired Chinese Knot. Another Chinese Knot has been incorporated into Wired Jewelry form, same as PIPA Knotting and Skylark Knotting, I am pleased to introduce you another knots that has unlimited potentials in Wire Jewelry Making – let your imagination run wild and you shall see the amazing outcome. The featured ring in the tutorial is like a "media" for me to knowledge transfer the technique, though it looks wonderful too. The beautifully taken 69 pictures (including the coverpage) will provide you the means from end to end to make this precious piece. In this document, it also listed out the tools and materials being used. You can create the bracelet by just looking at those high-resolutions pictures. You can also pay for the tutorial via PayPal by sending 9.95USD to decors.l@gmail.com by specifying "DCH004 ZHU.RING" in the title of the transaction, or click on the below Add to Cart button to purchase. The PDF format will be sent to the e-mail address set in your PayPal profile. PLEASE DO NOT LEND TO OTHERS, SHARE AMONG FORUM, SHARE AMONG FRIENDS, COPY AND MASS PRODUCE THE EARRINGS OUT OF IT. And if you would be so kind, please give a credit to me if my tutorial inspired you or helped you in your jewelry making journey, it would be greatly appreciated!